When you think of iconic images of women from Star Trek: The Original Series, the green Orion dancing girl from the first pilot, “The Cage”, (and later the two-part episode “The Menagerie”) has got to be near the top of the list. The image of the woman dancing, painted all green with bright red lips, was unlike practically everything else on TV at the time. 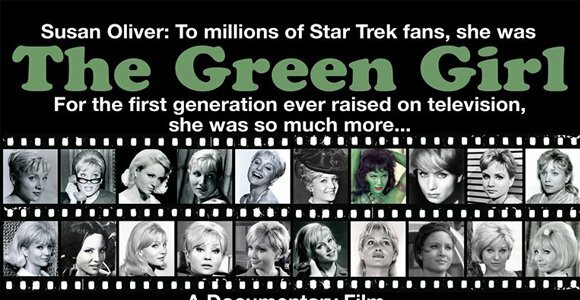 Go to a Star Trek convention today and you’re sure to find at least a couple of fans dressed up like an Orion slave girl; that first “green girl” started it all. Serious Trek fans will know the Orion “animal woman” is only one incarnation of the character Vina, and she’s played by Susan Oliver, an actress who is the subject of a new documentary directed by George Pappy, edited by Amy Glickman Brown. Pappy decided to make his film, The Green Girl, after casually deciding to look Oliver up on IMDB one day and realizing she was so much more than this one role, iconic as it was. “I found an eight or nine-page resume. And I saw she had directed a M*A*S*H and Trapper John, M.D. Thirty years ago, women were not directing TV; they’re barely doing it now,” Pappy said at a screening in Las Vegas this week. And yet, people today don’t seem to know much about this groundbreaking woman. The Green Girl runs at quite a clip through Oliver’s TV and film resume, which is extensive, to say the least. Film historians, critics, and her fellow actors remember her as incredibly versatile, able to play anything from a vamp to a junkie, to a person with split personalities, to a “good girl.” And, of course, a green girl. “There aren’t too many shows you can find from the late 50s to the early 70s that she wasn’t in at some point,” said Broadcast Historian Mark Topaz. For example, Oliver appeared as different characters in multiple episodes of Route 66, Rawhide, Wagon Train, Dr. Kildare, and The Virginian. Some weeks you could open the TV guide and find her in three different roles in three different shows. Watching snippets from her TV roles, as well as films she appeared in like Butterfield 8 (with Elizabeth Taylor), you can see what an incredible range she had. But there were even more remarkable things about Oliver, including the fact that, after a near plane crash, she decided to become a pilot, and ended up flying solo over the North Atlantic, under very treacherous conditions. She won five world records in flying light planes and was also one of the first women to fly a Learjet. So how is it that Susan Oliver, who played opposite so many big name stars, who directed for TV in the 1980s, who conquered her fear of flying and became a pilot, isn’t remembered as a big success, if she’s remembered at all? Sadly, the cutthroat nature of show business and sexism in the media seem to have been major factors. On her solo Atlantic flight, she was forced to land in Denmark instead of going all the way to Moscow, her goal, because the Russian government wouldn’t grant her the airspace. She returned to the States to reporters that called her flight a “failure” and seemed more interested in her legs than her piloting skills. “Did they ever ask Lindbergh to bear his biceps?” Oliver asked in her autobiography, quoted extensively in voice-overs during the film. As well, Oliver had turned to directing partly because she hit an age where there were very few female roles available, and partly out of a frustration with the limited nature of the roles there were. As Sociologist Kerry Ferris says in the film: “There just weren’t other roles…for middle-aged women that she could play” – she played college students well into her thirties and there didn’t seem to be anything for an age between “college student” and “grandma” in Hollywood. Interviews with actresses like Lee Meriweather (Catwoman in the 1966 Batman film) and Celeste Yarnall (Star Trek: TOS) reinforce the challenges of the era for actresses. Friend and fellow actor Gary Conway remembers, “For a woman to direct a film would be like a woman playing professional football.” When Pappy asks the other male actors he interviews if they’d ever worked with a female director, most said no. Oliver’s last acting job was in Freddy’s Nightmares in 1988. In the following year, she was diagnosed with colorectal cancer. She died in 1990 at the age of 58. The final scene in The Green Girl is the audio recording of the last voice mail message she left herself on the day she died, in which she says goodbye. The Green Girl is available on DVD and is expected to be available on demand in the fall. Jarrah Hodge is a feminist blogger from Vancouver, B.C. She runs the award-winning, multi-author feminist blog gender-focus.com, and she analyzes Star Trek from a feminist perspective over at her other blog, trekkiefeminist.tumblr.com. You can also find her on Twitter @jarrahpenguin. Here’s What Happened at the “Women of Trek Fandom” Panel at Star Trek: Las Vegas!